I'd never been to the county fair. We didn't have them growing up in New England - or if they did, my parents kept it a secret! I've been to the TN state fair, but that's a little different...this was our little hometown rural country fair. So we had a family learning experience! We rode on the "hay ride" with the karate school in the parade, and the we began our experience. Admission and whatever rides we wanted - priceless! I remembered back to some of the times I'd gone with my friends to our carnival - basically, same thing. As a teenager, I had chosen a different name to use if the ride operators began to flirt. The night had a cool breeze, and the was a feeling of adventure in the air. 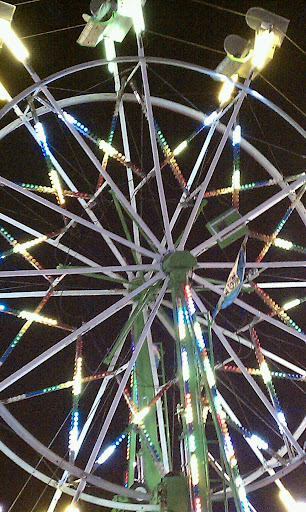 It smelled like the carnivals of days past - a mixture of fried dough, cotton candy and cigarette smoke, with a bit of freshly trampled grass lingering underneath. Not my favorite - bit fitting. The lights flashed, music blared and people screamed as a the rides they were on dropped suddenly. Some days, it would be too much - the noise, the smells, the visual noise. But, tonight I found myself tapping my foot to the music as my kids rode the bob sleds. It was a wonderful evening: the kids got to ride on whatever they wanted, and I got to ride with them on the Ferris wheel, and hear their laughter and excitement as we walked around.